Market research has well-known in-person methodologies such as focus groups and interviews to get in touch with target audiences. But what about those instances when you need to get insights from individuals that cannot all be in the same place at the same time? Telephone interviews and ethnographies are options, but what if time constraints make that difficult? Technology has given us the ability to go beyond location to get in touch with respondents. 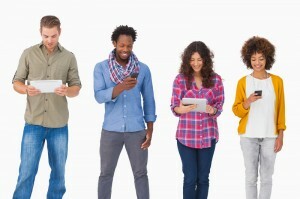 The internet and smartphones allow us to connect to others like never before, and market research is taking advantage of this. Here are a few examples of market research methods we use to connect to more people in more places. These methods can stand alone, but often times they are paired with other research methods to provide the best insights to drive business decisions. They are great tools because they allow for flexibility in location and time for respondents. This online forum can be very valuable because it allows moderators and respondents to interact from different locations and at different times. Respondents can sign in at any time from any location to answer questions and share their insights. Mobile journals allow you to see what your research subjects see as they go about their days. You may not be able to follow a respondent around as they shop for groceries or brush their teeth in the morning, but this methodology allows for respondents to chronicle their experiences. This is a great way to see exactly what your target audience sees from their perspective. With the usage rate of mobile phones continuing to grow, it makes perfect sense to send surveys to smartphones. Respondents have access to their phones at almost all times of the day, so there is an ease of access factor with this methodology in addition to allowing for flexibility in time and location. This entry was posted on Wednesday, November 19th, 2014 at 7:32 pm. Both comments and pings are currently closed.